Aizawl, Feb 22 : A zoologist teacher in Mizoram University said that he has 'rediscovered' a snake species called Liopeltis Stoliczkae, believed to have become extinct from the earth. H T Lalremsanga said this non-venomous snake was found at two places in Aizawl. He said one of the snakes was sighted at McDonald Hill while three of them were sighted and photographed on the Mizoram University campus. Earlier found in South Asia and parts of Asia, especially in Sikkim, Darjeeling, Naga Hills (then Assam) and Karen Hills of Myanmar, the noted British scientist W L Sclater discovered the Liopeltis Stoliczkae in Sikkim and Naga Hills in 1891. After the discovery, Indian zoologists were engaged in a search for the snake species, but failed in their endeavour till it was found by a young zoologist in Mizoram. Lalremsanga said, "This endangered species has been rediscovered after more than a century." The snake belongs to the family of Colubridae, and the total length of a male Liopeltis Stoliczkae can be up to 600mm. 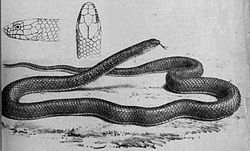 The body of the snake is greyish on top and lighter below, with a broad black stripe on the side of the head, extending and gradually fading, on the front portion of the body; a grey stripe on the outer margins of the ventrals and a less distinct and thinner median one may be present or absent. The rediscovery was announced after Lalremsanga and his colleagues conducted a detailed study on the snake.